Feeling Sleepy All the Time? Wake Up with a Detox! Doing a simple detox for even a short period of time is one of the best natural cures for fatigue and excessive tiredness. 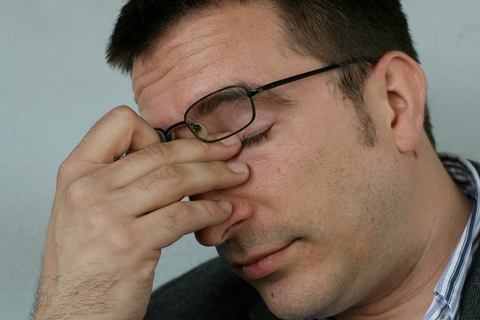 As many as 19.5% of Americans report having moderate excessive sleepiness. Feeling sleepy all the time zaps the fun out of life. It robs you of your motivation and can make it next to impossible to perform even your most basic day-to-day tasks. Instead of turning to caffeine, energy drinks, and sugar to keep you going, there’s a much safer, more effective solution that practitioners of integrative, natural, and alternative medicine have been using successfully with their patients—detoxification! As many as 19.5% of Americans report having moderate excessive sleepiness, according to a recent study from Stanford, while 11.0% report severe excessive sleepiness. While feeling sleepy all the time can be a sign of a serious chronic health problem like obstructive sleep apnea, diabetes or heart disease, in many cases the underlying cause is never found and patients are sent out of the doctor’s office without hope. This does not have to include you, however. Doing a simple detox for even a short period of time is one of the best natural cures for fatigue and excessive tiredness. The word “detox” is not referring to drugs or alcohol, or even to wheatgrass or enemas. Instead, detoxification refers to the science of how your body rids itself of waste—a metabolic process involving the liver’s detoxification enzyme systems. Although largely ignored by the general medical community, research is now uncovering not only the amounts, types, and health risks of the various toxins to which we are exposed, but also scientifically valid ways to enhance the human body’s capacity to detoxify. For instance, researchers are becoming clearer on ways to use diet and nutrition for intervention and prevention against environmental chemical toxicity and associated diseases. How does making short-term dietary adjustments enhance detoxification and keep you from feeling sleepy all the time? By avoiding meat, dairy, gluten, and non-organic foods, for instance, you reduce exposure to common allergens, food additives and toxins from foods. By increasing your intake of organic fruits and vegetables, you increase intake of nutrients (vitamins, minerals, antioxidants, and phytochemicals) required for detoxification-related biochemical processes. By eating specific detoxifying foods such as cruciferous vegetables, dark green leafy vegetables, sulfur-containing garlic and onions, and bioflavonoid-containing citrus, you increase intake of compounds needed to speed up the detoxification enzyme systems of the liver. By increasing fruits, vegetables, and other high-fiber foods along with plenty of pure water you reduce absorption and facilitate elimination of toxins. Try a simple detox by following these dietary tips for even a week or two. You will be getting rid of toxins and learning how to optimize your detoxification system. If you are feeling sleeping all the time or dealing with fatigue that just seems out of place for the amount of rest you get, doing a short detox is an essential step for boosting energy . Ohayon MM. Determining the level of sleepiness in the American population and its correlates. J Psychiatr Res. 2012 Apr;46(4):422-7. Koutsourelakis I, Perraki E, Bonakis A, Vagiakis E, Roussos C, Zakynthinos S. Determinants of subjective sleepiness in suspected obstructive sleep apnoea. J Sleep Res. 2008 Dec;17(4):437-43. Cory-Slechta DA. Studying toxicants as single chemicals: does this strategy adequately identify neurotoxic risk? Neurotoxicology. 2005;26(4):491-510. Patterson DG Jr, Wong LY, Turner WE, et al. Levels in the U.S. population of those persistent organic pollutants (2003-2004) included in the Stockholm Convention or in other long range transboundary air pollution agreements. Environ Sci Technol. 2009;43(4):1211-1218. Broding HC, Schettgen T, et al. Subjective complaints in persons under chronic low-dose exposure to lower polychlorinated biphenyls (PCBs). Int J Hyg Environ Health. 2008 Oct;211(5-6):648-57. Lee DH, Lee IK, Song K, et al. A strong dose-response relation between serum concentrations of persistent organic pollutants and diabetes: results from the National Health and Examination Survey 1999-2002. Diabetes Care. 2006;29(7):1638-1644. Ha MH, Lee DH, Jacobs DR. Association between serum concentrations of persistent organic pollutants and self-reported cardiovascular disease prevalence: results from the National Health and Nutrition Examination Survey, 1999-2002. Environ Health Perspect. 2007;115(8):1204-1209. Darras VM. Endocrine disrupting polyhalogenated organic pollutants interfere with thyroid hormone signaling in the developing brain. Cerebellum. 2008;7(1):26-37. Lee DH, Lee IK, Jin SH, Steffes M, Jacobs DR Jr. Association between serum concentrations of persistent organic pollutants and insulin resistance among nondiabetic adults: results from the National Health and Nutrition Examination Survey 1999-2002. Diabetes Care. 2007;30(3):622-628. Hennig B, Ettinger AS, et al. Using nutrition for intervention and prevention against environmental chemical toxicity and associated diseases. Environ Health Perspect. 2007 Apr;115(4):493-5. Lamb JJ, Konda VR, et al. A program consisting of a phytonutrient-rich medical food and an elimination diet ameliorated fibromyalgia symptoms and promoted toxic-element detoxification in a pilot trial. Altern Ther Health Med. 2011 Mar-Apr;17(2):36-44. Bland JS, Barrager E, et al. A medical food-supplemented detoxification program in the management of chronic health problems. Altern Ther Health Med. 1995;1(5):62-71. Sears ME, Genuis SJ. Environmental determinants of chronic disease and medical approaches: recognition, avoidance, supportive therapy, and detoxification. J Environ Public Health. 2012;2012:356798. Genuis SJ. Elimination of persistent toxicants from the human body. Hum Exp Toxicol. 2011 Jan;30(1):3-18. Hofmann T, Kuhnert A, Schubert A, Gill C, Rowland IR, Pool-Zobel BL, Glei M. Modulation of detoxification enzymes by watercress: in vitro and in vivo investigations in human peripheral blood cells. Eur J Nutr. 2009 Dec;48(8):483-91. Hyman MA. Environmental toxins, obesity, and diabetes: an emerging risk factor. Altern Ther Health Med. 2010 Mar-Apr;16(2):56-8. Mutter J, Naumann J, Guethlin C. Elimination of xenobiotics in a female patient with fibromyalgia, chronic fatigue, and trunk obesity. Forsch Komplementmed. 2007 Feb;14(1):39-44. Lampe JW. Diet, genetic polymorphisms, detoxification, and health risks. Altern Ther Health Med. 2007 Mar-Apr;13(2):S108-11. alcohol, alternative medicine, antioxidants, apnea, boosting energy, brain, caffeine, caffeine energy, cardiovascular, cardiovascular disease, chronic fatigue, cruciferous vegetables, dairy, detoxification, detoxify, diabetes, diabetes care, diet, elimination diet, energy drinks, environmental toxins, excessive tiredness, feeling sleepy all the time, fiber, fibromyalgia, fibromyalgia symptoms, food, garlic, gluten, health, health and nutrition, health problems, heart disease, hormone, insulin, insulin resistance, integrative, natural cures for, natural cures for fatigue, nutrients, nutrition, obesity, obesity and diabetes, obstructive sleep apnoea, organic, pain, pesticides, pre diabetes, report, sleep, sleep apnea, sleep apnea diabetes, sleepy all the time, sugar, supplements, thyroid, thyroid hormone, tiredness, toxins, vegetables, vitamins, vitamins minerals, wheatgrass. I thought you might be interested in this article on https://universityhealthnews.com: Feeling Sleepy All the Time? Wake Up with a Detox!